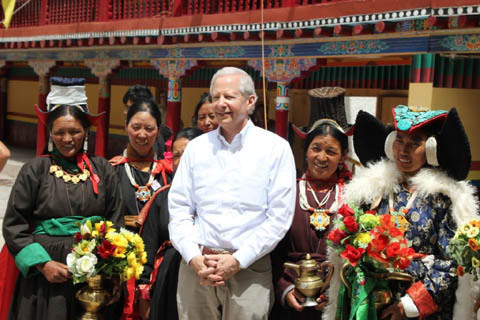 The United States Ambassador to India, Kenneth I. Juster made his first ever three-day visit to Ladakh region of Jammu and Kashmir, an official said today. “During his visit to Ladakh, he met His Eminence Drukpa Thuksey Rinpoche Jigme Mipham, the spiritual representative to His Holiness the Gyalwang Drukpa,” he said. The Ambassador also visited the Hemis Monastery and Druk Padma Karpo School. The Hemis Monastery is one of the oldest and most prominent monasteries in Ladakh and is held in great esteem by Buddhists of the Drukpa sect. “The Ambassador received a warm traditional welcome in both Hemis and Drukpa Padma Karpo School [also known as the ‘Rancho School’ – where the film 3 Idiots was shot],” said the official.